In the automatic winding watch, the mainspring must be designed to prevent over winding (with continuation of automatic winding) when the spring is fully wound. 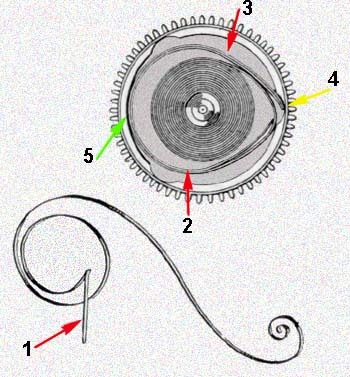 This is usually accomplished in contemporary watches with a slipping bridle on the outer end of the mainspring as illustrated above (1). The bridle (in the barrel, 2) maintains outward pressure on the outermost coil of the mainspring (3). At less than full wind, the bridle pressure causes the outer tip of the spring to catch in a notch in the barrel wall (4) and maintain its position. As the mainspring reaches full wind, the outer end of the spring jumps out of the notch and releases tension by slipping across the smooth section of the barrel wall (5) until it catches in the next notch. To see the complete mechanism in an automatic winding watch, click here.